You’d think it would be big news that there’s a liberated area in the Middle East led by socialist-feminists, where people make decisions through local councils and women hold 40% of leadership positions. You’d think it would be even bigger news that their militias are winning territory from ISIS. But many on the U.S. left have yet to hear the story of the Rojava cantons—Afrin, Cizîre, and Kobani—in northern Syria, or western Kurdistan. 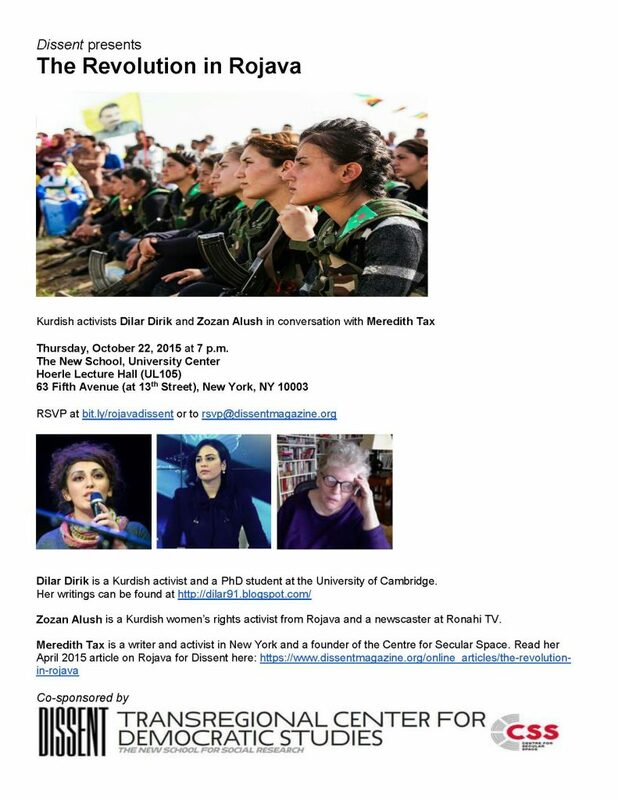 Thursday, October 22, 2015 at 7 p.m.
Dilar Dirik is a Kurdish activist and a PhD student at the University of Cambridge. Zozan Alush is a Kurdish women’s rights activist from Rojava and a newscaster at Ronahi TV.